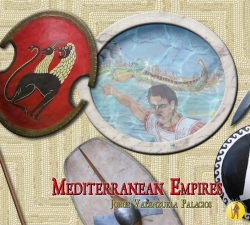 Mediterranean Empires is a strategy game for 2 to 8 players representing the turbulent power struggle between the various powers of the Mediterranean Sea before the emergence of the Roman Empire, which after conquering the lands surrounding this sea called it Mare Nostrum (our sea). 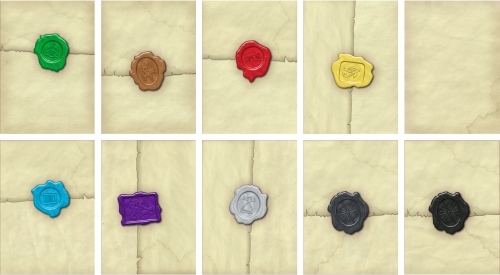 Each player will lead one of these empires, in his hand, the cunning and luck will guide either to victory or annihilation. 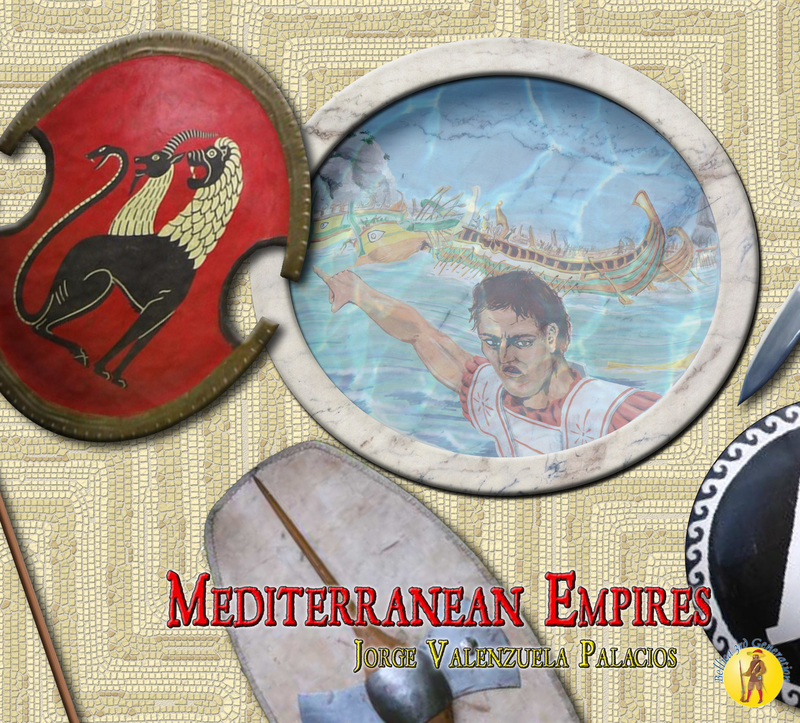 Mediterranean Empires is a game accessible to players of all levels of experience from 12 years, not a war-game but a simple strategy game. The game is designed to prime fun and playability, and the key to this is the constant interaction between players. Each player has a deck of cards, these cards are the player's resources (troops, fleets, leaders etc.). 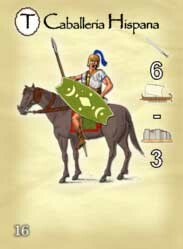 The game is played in 3 turns, each turn is divided into a variable number of rounds of play, players will not know how many rounds will be played since the end of the turn is decided by a dice roll. Greece: In the early V century B.C. Greek city-states waged war to each other for control of trade and limited arable land in mountainous Greece. 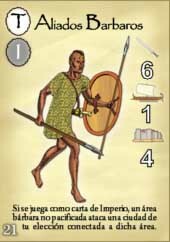 Among them two powers with a completely different concept of state, democratic Athens and militaristic Sparta. These cities, and most of the others, were forced to form a common front after the invasion of the Persians, which gave rise to the so-called Persian Wars. Macedonia: In the year 336 B.C. after the death of King Philip II, the great transformer of the army and the Macedonian Kingdom, Alexander III, his son, is elected king with only 20 years. Many challenges await, in the north Thracians and Illyrians, in the south of the riotous Greek city-states and - most difficult of all - the conquest of the Persian Empire already planned by his father. This young king eventually rose to all challenges and was remembered as Alexander the Great. Persia: The western Satrapies of the Achaemenid Persian Empire. By the middle of IV century B.C. the Persian Empire was the greatest of the known world. Although far from the strength that had enjoyed 200 years before under its founder Cyrus the Great or just before the start of the Persian Wars under Darius, it was still a formidable enemy. Its wealth and the number of warriors forming in the army of the King of Kings were impressive. Egypt: In two different periods from 525 to 404 BC and again from 343 to 332 B.C. the Achaemenids ruled Saitic Egypt, so called named for its capital Sais in the western arm of the Nile delta, however, between these two periods the Egyptians achieved independence from the Persians, largely with the help of Greek mercenaries. Egypt again became a powerful empire, again setting its sights on overseas expansion. Carthage: Territorial and commercial growth led the Carthaginians to be the first economic and military power in the western Mediterranean. In the early third century B.C. they came into contact with the other great republic of the time, Rome, which was also immersed in a large territorial expansion project. Conflicting aspirations of both republics caused the hatred and rivalry which provoked three long wars called Punic Wars. Rome: The Roman Republic was a period of Roman history characterized by the expansion of this powerful city. In the second half of the third century B.C. Rome projected its power outside Italy, which led to a series of clashes with other major powers in the Mediterranean, defeating Carthage and Macedonia and annexing their territories. 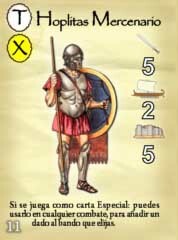 Hispania: In the second century B.C. after the Roman victory over the Carthaginians in the Second Punic War, the southern coast of the Iberian Peninsula is subject to Rome, the various Hispanic peoples saw this as a breach of the covenants made with Rome, so they rebelled. 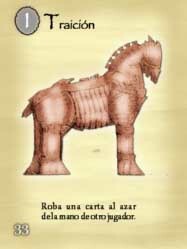 The defence of Numantia by the Celtiberians and the Lusitanian revolt under the leadership of Viriato have gone down in history as a faithful reflection of the Spanish tenacity to defend their homes. Gaul: The Celts called themselves galiain (i.e. Gauls). The so called Gaul was a group of villages composed of different tribes and ethnic backgrounds. In 56 BCE Julius Caesar intervenes, with the excuse of a war between the tribes of the Edui and Arverni, and the friendship with Rome of the first. In a few years Caesar subjected the whole of Gaul. All? Not quite! in the year 52 B.C. 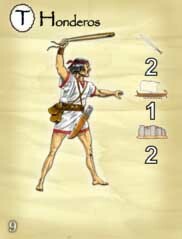 Gallic chieftain Vercingetorix revolted against Caesar, leading the Gallic tribes to expel the invader. 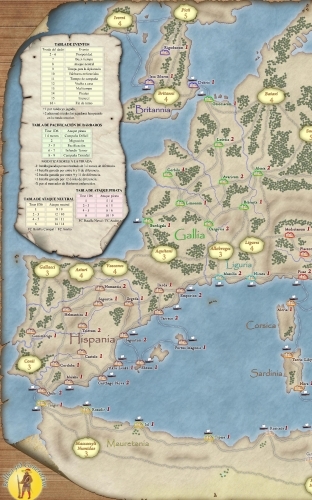 - Mounted full color game board: A Anciente map depicting the Mediterranean divided into historical regions used according to the scenario. On the board are the most important cities of antiquity represented by a symbol of the city (and a boat if the city has a port) and barbaric areas represented by a circle. Cities and barbaric areas are connected by roads and straits. - 280 game cards over 8 decks of cards of 35 cards, one for each empire. In each deck you can find 7 different types of cards: Troops, Fleet, Leader, City Defence, Attack on City, Empire and Special Cards. 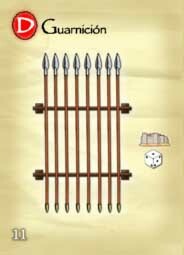 - 330 wooden disks: 32 fortification markers per Empire, 50 fortification neutral markers, 24 barbaric pacified zone markers. - One 3/4" countersheet of die-cute counters. - 12 wooden six-sided dice. Build your Empire. Conquer and expand. 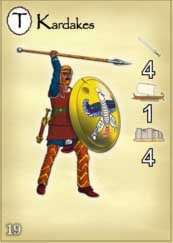 Defend your realm to become a dominant power in the Ancient Mediterranean Sea. 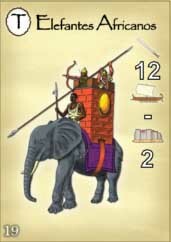 Strategy card-driven game for 2 up to 8 players.